So another Halloween has come and gone. We decorated our little hearts out, hosted our annual party, and went to a party besides. The only disappointment was out utter lack of trick-or-treaters. Where I live, houses are pretty far apart, plus we're on a main road with no sidewalks or street lights, so I knew it was unlikely anyone would bother, but I still hoped. From 6:15 when I got home from the day job until the 10 p.m. town curfew, we had the lanterns lit & fog/lightening machines going. Hopefully, at least people driving by enjoyed it. I did get to have fun painting, though. On Saturday the 26th, before our own Halloween party, I was back at the Woof Gang Bakery for their Howl-O-Ween party & dog costume contest. Don't worry, I wasn't painting pets this time, just the people who brought them. Yet again, I love this place and the people who comprise their customers. What a great group! Even though I never, even take gigs on the day of my own party, I couldn't say no to this one and am glad I went. It was so much fun! I loved these sisters who thought they'd challenge me with a pig, dinosaur, and cow. I promise this boy was happy with his dog. I think the flash got him. This young lady asked for a "groovy skeleton," which turned out to be the Halloween costume she'd be sporting on Thursday. Not having a visual made me nervous, but her sister was kind enough to let me know it had pink & purple, so this is what I came up with. She loved it! She loved it to the point of sitting back in her chair from excitement. Score! I did this rose on an employee, who loved it. Glitter tats weren't a huge thing at this event, probably because everyone had Halloween on the brain. My witch was really happy too, and I'd love to see what her mom did for her on Thursday, since her Halloween costume was witch too. 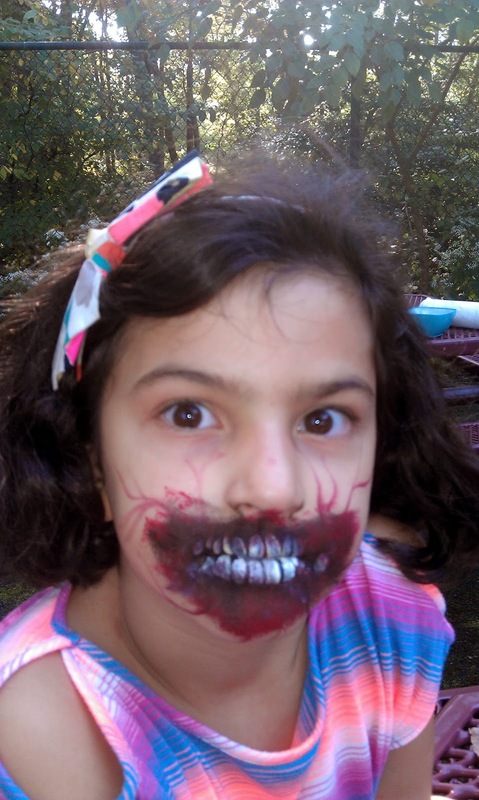 And as usual, the zombies were a hit. You know I love it when they get into character. And this past Saturday, we went to a party at friends' too. I'd already done myself as a vampire on the 26th, so for the 1st, I was a zombie. If you're from the area, you may have seen Woof Gang Bakery & Grooming in Allendale, NJ. In September, they celebrated their one year anniversary at that location, and I celebrated with them! It's a great place with really nice owners Ed & Linda, pleasant and welcoming staff, homemade dog treats (which Meg adores), non-homemade cat treats, pet toys, and grooming. And if the photos on their Facebook page are any indication, they're really good groomers too. For the occasion, I adorned myself with one of my freehand glitter tattoos. It was so well liked, I did one on one of the customers too! Mostly, though, I was face painting the bakery's patrons. It really was just such an easygoing, relaxing event, and the bakery's patrons are phenomenal. Honestly? I love it there! And I got Meg 3 bags of treats, which I'll be returning to replenish once she's eaten 'em up. I only had two gigs this weekend, but I think I may have painted enough faces in 4 and a half hours to rival the Tribeca Film Festival painting days! On Saturday afternoon, I made my second annual appearance at the Glen Rock Newcomer's Association's kickoff party. I was there for two hours, flying like the wind, but man, did I have fun. I worked from a limited list of my fastest faces to keep things moving quickly and was assigned a couple of teens as line managers who did a phenomenal job making sure the kiddos had their choices made before hitting my chair. I obviously didn't have time for photos, but did ask one of the girls to take two photos of faces I especially liked. This was a slightly different take on my typical dragon and I thought it was cute. Even more fun was my new "Zombie bite" face, inspired by Pashur, a master body artist out of Las Vegas. It may just be my new favorite face. How creepy is she?! Those eyes! Gotta say, I wouldn't want to meet up with that face in the middle of the forest. Or city, for that matter. That face was such a hit on Saturday, that I brought it out again on Sunday, when I painted for the very first time for the Heat & Sole Walk to benefit heart failure and transplant patients. What an amazing group! The funniest thing to me, and I regret not getting a photo of him, was an older boy who saw my zombie bite and just had to have one. 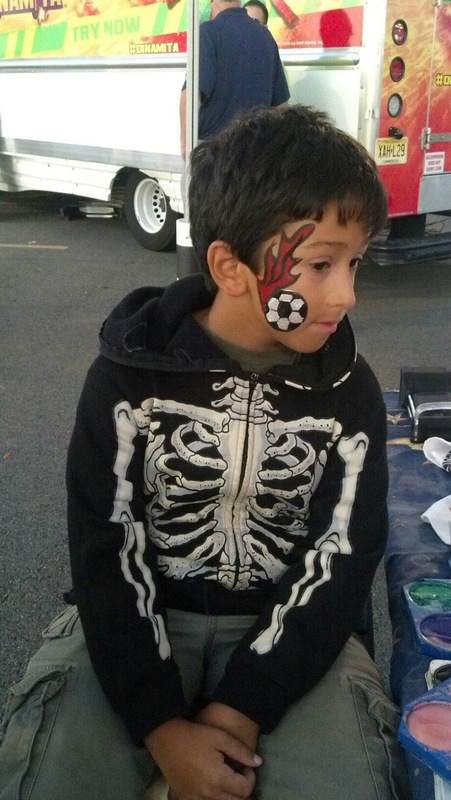 While I was painting him, he told me, "You painted my sister at a party at Bounce U a few weeks ago!" and showed me a photo on his phone of a pink kitty that was easily recognizable as one of mine. Turns out this young man was at that birthday party, which was for a five-year-old girl and her friends, and was too old for face painting.... until he saw the cooler options he had this time around! Ha! I call that vindication, my friends. This face also inspired an adult woman to have me "do something creepy" on her arm, and was happy with what I came up with. To be honest, so was I. Fun, right? In case you can't tell, Halloween is my favorite holiday. I had a lot of my regular fare too, including one boy who was really excited when I told him, in listing several options and ideas, "When I say I can do a bear, I mean panda, polar, or brown bear," and exclaimed happily, "Brown bear!" So a brown bear he was. Now I just hope they have me back next year! Over the holiday weekend, I had too many fun plans of my own to take any paid events. On Saturday, Eric and I went up to our friend's 40th birthday in Connecticut, which she was celebrating as a 4th birthday. 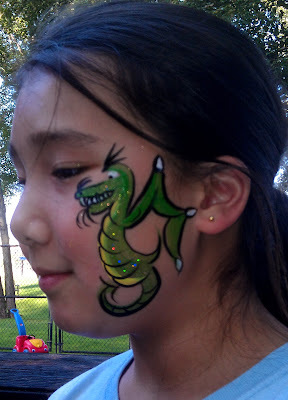 Well, what does a face painter do when her 40-year-old friend holds her own 4th birthday? 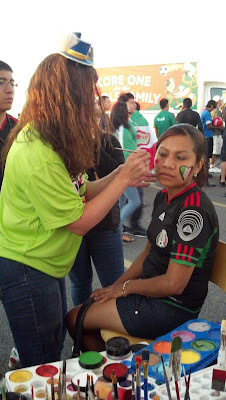 Brings the face paints, obviously. Only one other paintee at this party, and not to theme, but pretty clear if I do say so myself. Then on Sunday when it was raining, we headed with some friends to Monster Golf. If you haven't got one near you, it's indoor mini golf in blacklight. 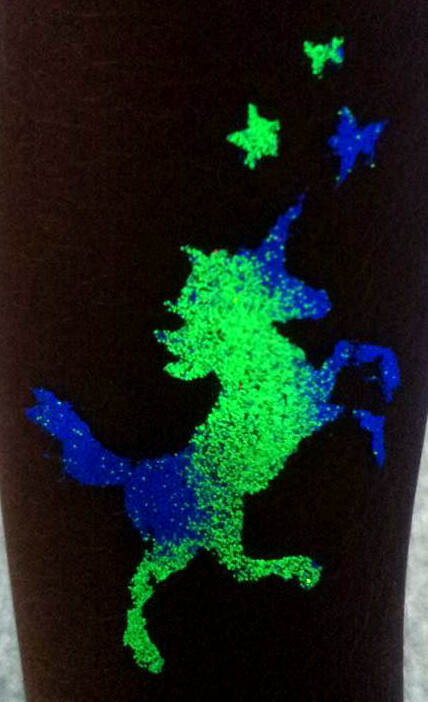 So of course, I had to break out the UV glitters for some glitter tattoos! Did those on our friends' daughter and son, and freehanded this one on myself. 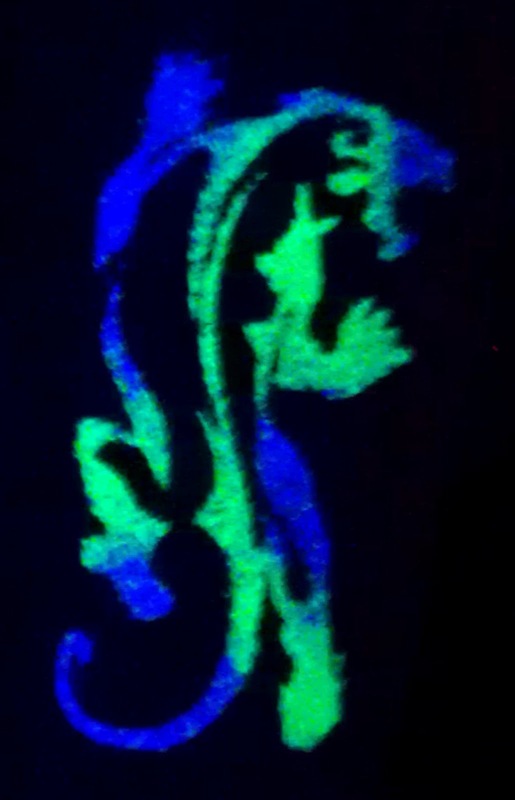 I do so love blacklight! I painted at what was probably one of the cooler events of my career on Wednesday, together with my friend, Emilie, who I hired for the event. 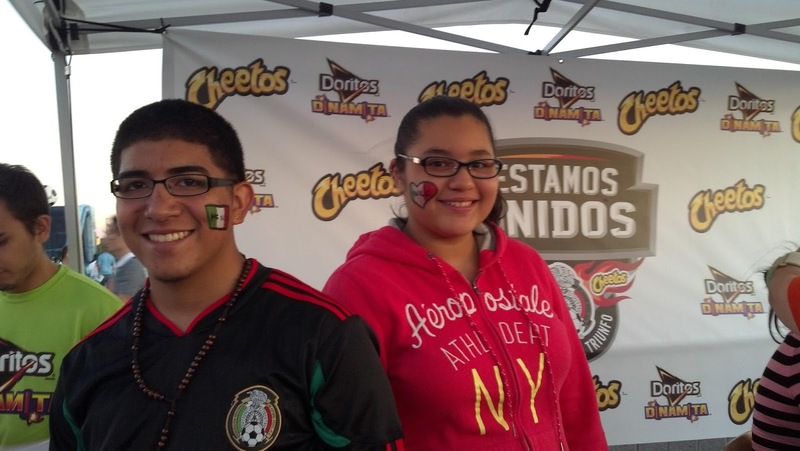 It was the Mexican National Team vs. Ivory Coast soccer game at the Meadowlands in East Rutherford, NJ. We were representing Doritos & Cheetos, and painting in their area while they handed out free samples of their new flavors to the patrons for four hours before the game. Speaking of which, if you like spicy - really spicy - be sure to try the new flavors when they come out. My mouth was on fire! Anyway, four hours of nonstop face painting, and it was a mad scene! We had awesome line managers, which helped immensely, and the patrons were really great, but wow, that was a lot of fast painting. We had to move very quickly to get as many people as possible done, but one of the line managers was kind enough to take a few photos. My most requested design was probably a full face Mexican flag. Second most popular was probably cheek art flags in rectangle or heart shapes. And of course, there were the flaming soccer balls. Can't go wrong with a flaming soccer ball. 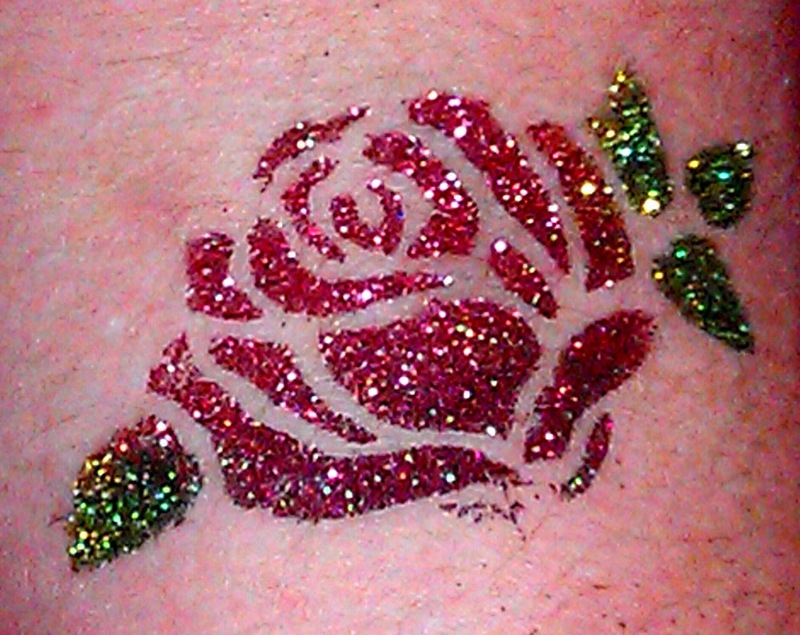 Especially since I'd done a freehand flaming soccer ball glitter tat on my arm for the occasion! Now next time they have to hire me to do temp tattoos! I may as well tell you about another party I worked this weekend, a "birthday party" for the Irish Cottage Inn, in Franklin, NJ. I didn't eat or drink there (yet, since I plan to go back with Eric & try it out), but it looked like a great place. Once we do actually try it, I'll have to report back. It's up in Sussex County, out in the country, and was a nice drive. The people that run the Inn and work there were incredibly nice, laid back, and fun. And the kids were great about picking all different things! I think I only had two butterflies, and other than that and these zombies, everyone was different. That scary one getting into character is the two-year-old brother of the other! So wanting a similar face makes sense; when we were kids, my little sister wanted to be like me too. How cute are they?! But I started this talking tattoos. 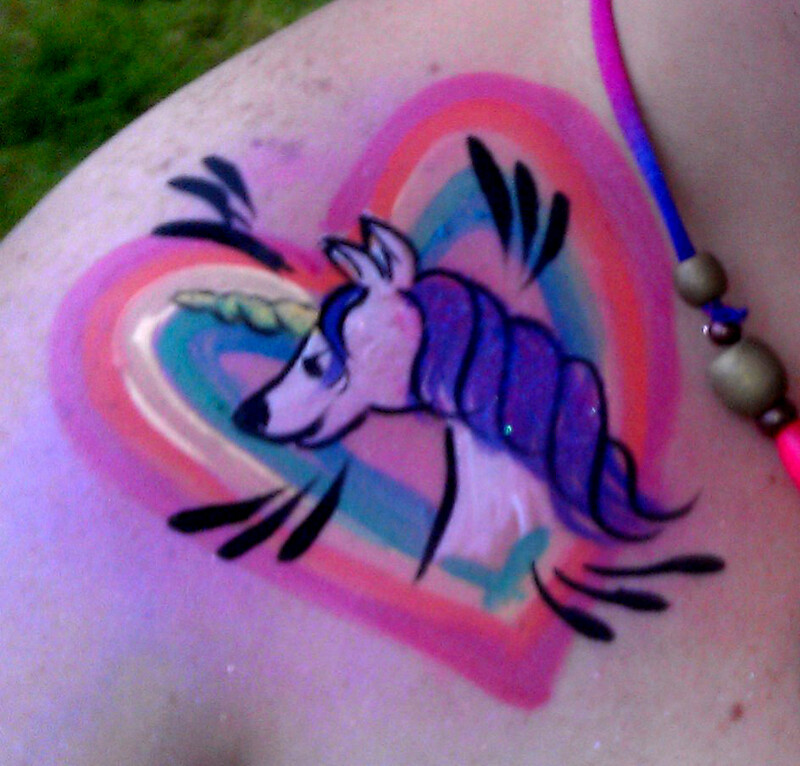 I was face painting and tattooing at the party. What's more fitting at the birthday party of an Irish pub than a Celtic shamrock tattoo? And what's more fitting than a lizard? Um.. maybe not. A dragon? OK, fine, I'm kidding, I'm kidding. But I did do this cool freehand flower. I'm loving these freehand tattoos! Back to the painting. Bunch of characters at this event. This little girl was hoping for a turtle tattoo, but wanted it on her cheek, which I won't do, so she opted for painting rather than a turtle on an arm. Her older sister wanted to be a Sun, of all things! And on that note, I sign off for now. ... and Now for Something Completely (well, ok, partly) Different! I've been having more fun with the temp tats recently, because I've started doing more freehand tattoos. With brushes or a special art pen I've acquired, I can do pretty much anything I want. On myself, I tried this gorgeous flower design. Know what this would be perfect for? 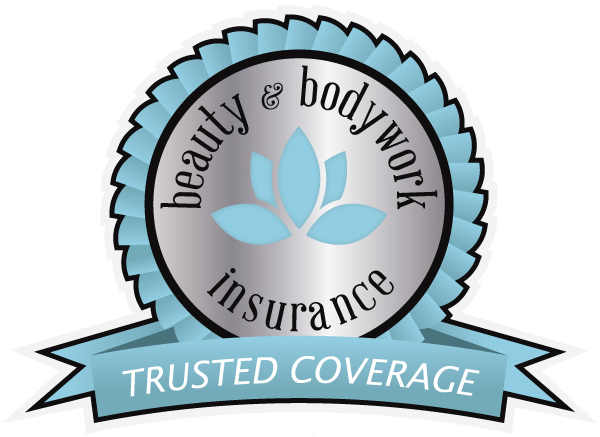 Wedding, bachelorette party, and prom tattoos! How awesome would that be? The heck with buying jewelry; I'll stick it right on you! I didn't leave out the less flowery types, though. I had to try out this cool dragon too. 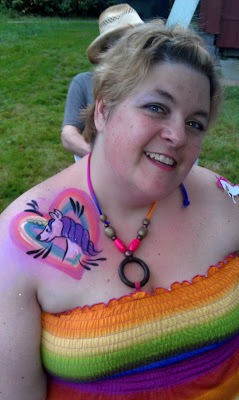 While I do have dragon stencils, it's kind of cool to translate the dragons I face paint right into my tattoos too. 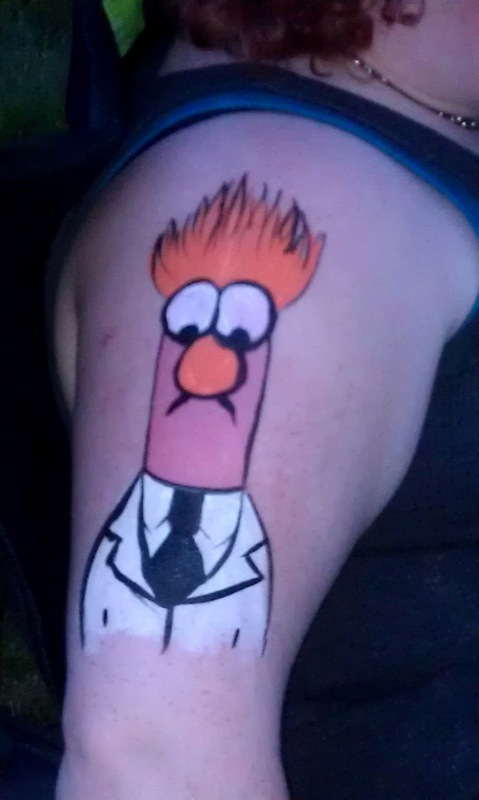 And this past Sunday at a tattoo party I worked for a christening in Oakland, NJ, This tattoo was the biggest hit of the party! It was so fun to do, but was even better when the boy who'd taken me up on my challenge of "if you don't see something in my book, we can make something up" saw the final result. He was so proud of it, and his dad was a huge fan too!